GALION — This week, on National Rural Health Day, the Ohio Department of Health recognized Avita Health System’s Galion Hospital with The Chartis Center for Rural Health (Chartis) and the National Organization of State Offices of Rural Health (NOSORH) for overall excellence in outcomes. This reflects top quartile performance among all rural hospitals in the nation. Galion Hospital is among 18 Ohio rural providers recognized for overall excellence in 2018. “Across the country, rural providers are under tremendous pressure from a variety of market forces. On the day in which we celebrate the power of rural, it’s wonderful to be able to recognize top performers who – despite the challenges – are raising the bar with regard to providing higher quality of care within their communities,” said Michael Topchik, national leader of Chartis. For more information on National Rural Health Day, visit www.powerofrural.org and follow the conversation on social media at #powerofrural. Courtesy photo These Galion Hospital employees are part of the reason the local hospital has been recognized for rural health experience. From the left are Samantha Amick, Amy Dawson, Sara Dials, Samantha Detwiler and Jason Atwell. 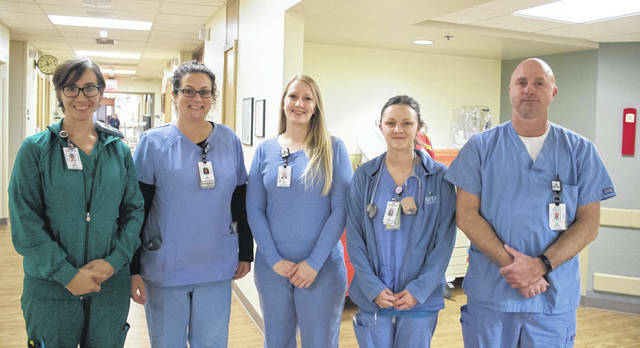 https://www.galioninquirer.com/wp-content/uploads/sites/38/2018/11/web1_IMG_9678_90.jpgCourtesy photo These Galion Hospital employees are part of the reason the local hospital has been recognized for rural health experience. From the left are Samantha Amick, Amy Dawson, Sara Dials, Samantha Detwiler and Jason Atwell.